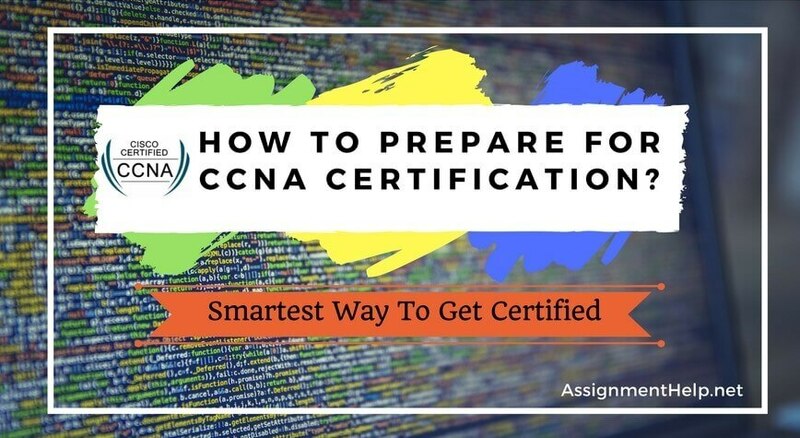 CCNA Assignment Writers | How to prepare for CCNA certification? How to prepare for CCNA certification? CCNA Cisco certification is one of the best certification one can lay his hands on in the field of networking. With each passing day, the popularity of this certification is increasing more and more. A huge number of professionals take this certification every year and this number is increasing. This certification is widely regarded to provide the highest quality of training in the field of networking to the professionals and preparing them for a very bright future in this industry. This certification trains the professionals for everything that they might face in their careers. This is the reason why this certification is so popular and coveted among the professionals. The CCNA cisco certification is one of the Cisco Career certifications. There are a number of cisco career certifications available out there for the professionals to choose from. These certifications come in different categories. For anybody who is even thinking about getting the CCNA cisco certification, it is very important to know all about the Cisco organization that provides all these certifications and also about all these certifications. Cisco Systems (simply known as Cisco) is an American multinational technology corporation. This conglomerate is headquartered in San Jose, California, right in the heart of Silicon Valley. Cisco is a very big and famous name in the field of networking hardware. This giant corporation manufactures and sell networking hardware, telecommunications equipment and many other high technology products and services. There are number of subsidiaries that this corporation has acquired. Some of these subsidiaries are WebEx, Jasper and OpenDNs. Through these numerous subsidiaries, this huge corporation specializes in particular tech markets like domain security, energy management and Internet of Things. Cisco was founded by two Stanford University computer scientists named Leonard Bosack and Sandy Lerner. Leonard Bosack was in charge of the Stanford University computer science department’s computes and Sandy Lerners was his wife. She managed the Graduate School of Business’ Computers. It was founded in 1984. These two computer scientists had pioneered the concept of a LAN (Local Area Network) being used to connect disparate computers over a multiprotocol router system. By the time when this company was listed on the American Stock Exchange, NASDAQ, when the company went public in 1990, it had a market capitalization of a whopping $224 million. Ten years later, in 2000, the market capitalization of this company had grown to more than $500 million and by this time, it had already become the most valuable company in the world. The Cisco Certified Network Professional (CCNP) certificate indicates that you have skills needed for working as network engineers and network technicians or even as support engineer and systems engineer. the CCNP routing and switching assignments are based on delivering knowledge of routing and switching protocol for physical networks as well as the virtualized network functions. At Assignmenthelp we have the best expert computer networking CCNP routing and switching assignment tutors to guide you with the CCNP projects, computer networking routing and switching lab assignments and help you to get the coveted CCNP certification. The Cisco Certified Network Associate (CCNA) certification for routing and switching is an integral step to computer networking in controller based architectures. The certification equips you with the core skills of a network engineer and will help you to manage and optimize network systems, network infrastructure, routing and switching as well as learn skills for wireless access, security, and connectivity to branch offices using WAN. Assignmenthelp.net has the best online computer network engineering experts for routing and switching projects, CCNA assignment answers as well as to help you understand complex concepts for CCNA routing and switching lab assignments. Cisco Certified Entry Networking Technician (CCENT) certification is based on concepts of Cisco switches, routers, avoiding security threats, concepts based on wireless networking and of protocols such as the TCP/IP and OSI models, IPv4 & IPv6 addressing, WAN technologies; operating and configuring IOS devices; and configuring simple networks. Many students pursuing CCENT certifications often struggle to understand the complex tasks such as implementing and routing between VLANs, IPV6,ACLs and implementing NAT,PAT,and DHCP or lab assignments related to configuring simple networks and other tough concepts related to WAN technologies, OSI models, TCP/IP protocols and much more. Therefore, they need expert and reliable network engineering tutors to help them with CCENT assignments and CCENT projects such as lab reports. Assignmenthelp.net is the best online computer network assignment help website for all CISCO programs including CCENT. CCNA Data Center certification offers professionals job-ready training and skills. The certification lays the foundation for job roles such as a data center network administrator. You gain foundational knowledge in installing, configuring, and maintaining data centers. CCNA Security certification for careers like network security specialist, security administrator, and network security support engineer covers fundamentals of securing Cisco routers and switches and associated networks. Expert CCNA security network assignment help tutors are online at assignment help to solve all your projects and assignments. CCNA Service Provider program is based on understanding about networking engineering concepts like configure, implement, troubleshoot, and optimize IP next-generation service provider networks for successful implementation and optimization of carrier-grade IP next-generation networks. Many network engineers and technicians pursue this program for being able to work with intelligent and rapidly deployable managed services . The certification program involves complex assignments , lab assignments and projects that require solutions. Students looking for CCNA service provider assignment help and project help must instantly hire the best online network engineers at assignmenthelp for CCNA service provider assignment answers. The CCNA Cloud certification is pursued by Cloud engineers, Cloud Administrators as well as many Network Engineers. The certification is based on development of cloud skills for IT organisations for business technologies. The CCNA Cloud certification enables them to provide Cisco cloud solutions to enterprises. Cloud Computing and Cloud networking assignment help is available online at assignmenthelp by online certified cloud networking experts and cloud engineers for best assignment help services in CCNA cloud assignments and projects help. CCNA Collaboration is mean for network video engineers, collaboration engineers, IP telephony and IP network engineers. The certification is a professional development requirement and helps them with collaboration and video skills such as convergence of voice, video, data and mobile applications. For help with CCNA collaboration assignments and lab projects, contact our Live Chat Support executives and hire the best computer networking assignment writing experts.